The Blair Witch Project, a dossier complied by DA Stern. October 1994 three student film makers disapperaed in the woods of Maryland USA while shooting a documentary. One year later their film footage was found. 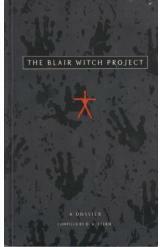 This book pieces together what really happened in the woods, the journals, rime sceen photos, the legends, facts anad myths surrounding the Blair Witch.